John DiMaggio <3. The many voices of John DiMaggio! I cna't do James Patrick Stuart या Tom McGrath because they don't play alot of characters :( Enjoy!!!!. Wallpaper and background images in the पेंग्विन्स ऑफ मॅडगास्कर club tagged: rico penguins of madagascar skipper penguin kowalski penguins private madagascar. 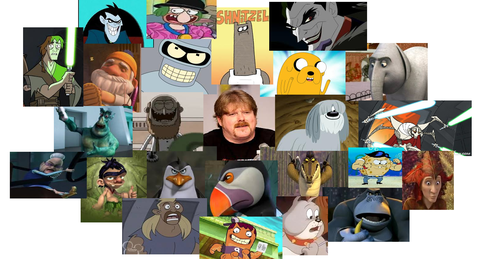 The many voices of John DiMaggio! I cna't do James Patrick Stuart या Tom McGrath because they don't play alot of characters :( Enjoy!!!! Besides the Penguins of Madagascar characters, I only recognize Dr. Drakken and the "Seriously!" guy (don't know his name, either. XD) from Kim Possible, the alien guy from Space Chimps, and the alligator from Kung Fu Panda: Legends of Awesomeness. I know that dog from Adventure Time, but I really don't like that show. But isn't that gray dog at the bottom from Tom and Jerry? Or is it a different show? I think I recognize him. @sarah12499: I thought he was. Thanks! @PB: No I didn't :D that's so cool I haven't watched it in so long but now that you mention it he does sound just like him! oh yeah fun fact time for me! I also found out Nicole Sullivan plays Shego! He sure did voice a lot of characters. He also did Fu Dog on American Dragon Jake Long. Dont forget he does the voice of Marcus Phoenix from Gears of War video games.